Back from holiday and rearing to go. Who am I kidding? I always find it so incredibly hard to get back into the routine of work once I've been away. Having to keep on top on what is happening in the world of fashion is no easy feat I can tell you especially when there are so many summer sales about. I can't think of a better distraction though. It's one thing to join the buzz of the high steet but I find that I see so much more variety online than I actually find in the stores when I'm physically there. I mean I passed through Debenhams on the weekend but I didn't see this black print dress perfect for this great summer weather we have been having lately. This print dress will absolutely compliment my latest summer leather sandals. The thing is I never go through an entire store from department to department and clothes believe it or not are not the only items I shop for online. 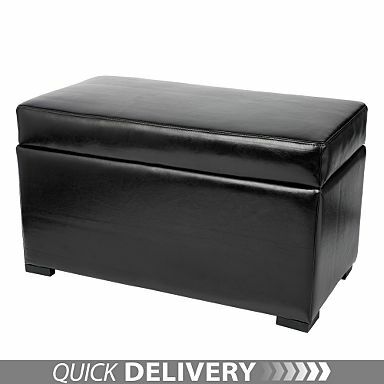 Take this leather storage bench for instance I have been promising myself to get a storage bench for my bedroom for ages. They are so convenient for putting away those extra blankets and sheets and a must have for putting on your shoes upstairs. I did have a wooden one in mind but this storage bench is far safer for the children when they are bouncing around in my room - no sharp edges. There are some great online bargains to be had, so leave the car in the driveway put your feet up and let your fingers do the walking. You will be amazed at the bargains you find online. Online shopping have never been better.